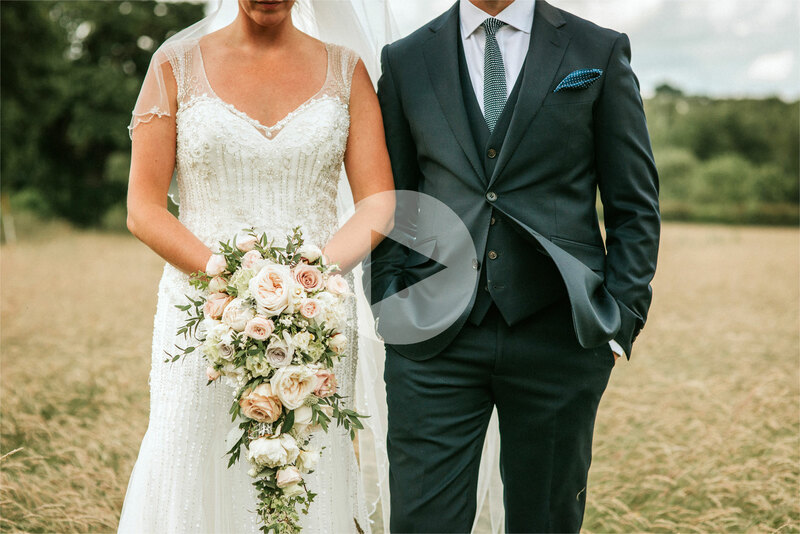 Gemma and Mark had a clear vision for the flowers for their big day; they wanted flowers with colour that popped! 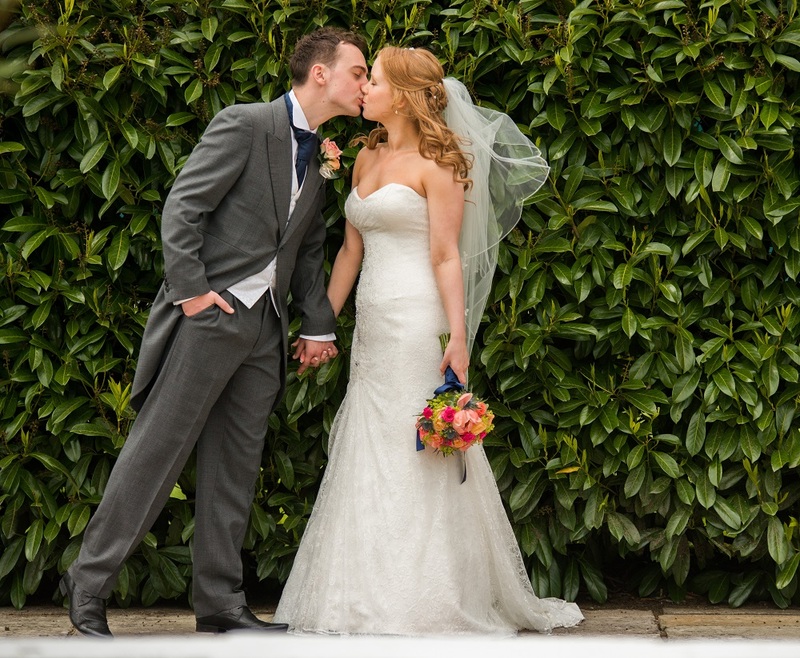 They held their ceremony and reception at the beautiful Georgian Manor House, Manor of Groves hotel in Hertfordshire. The bridesmaids wore navy blue dresses, in a variety of styles, so Gemma wanted her flowers to stand out against the blue backdrop. 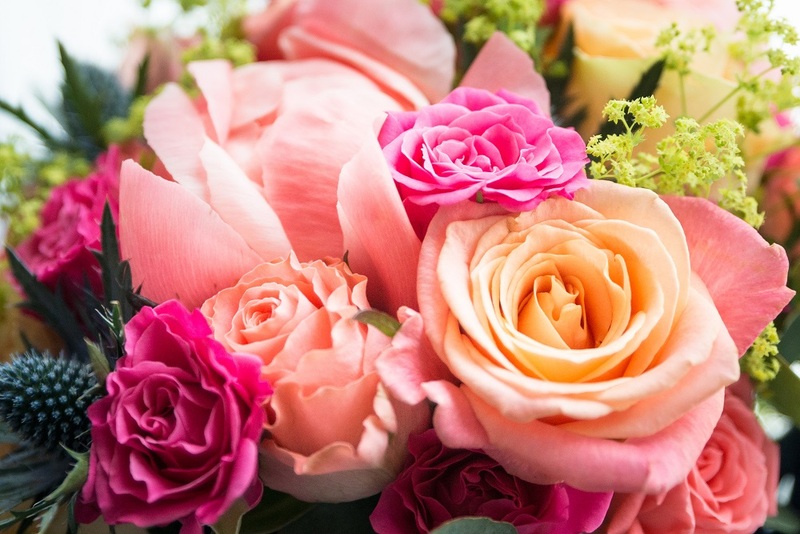 She wanted accents of colour; corals, peaches, oranges, hot pinks and lime green. 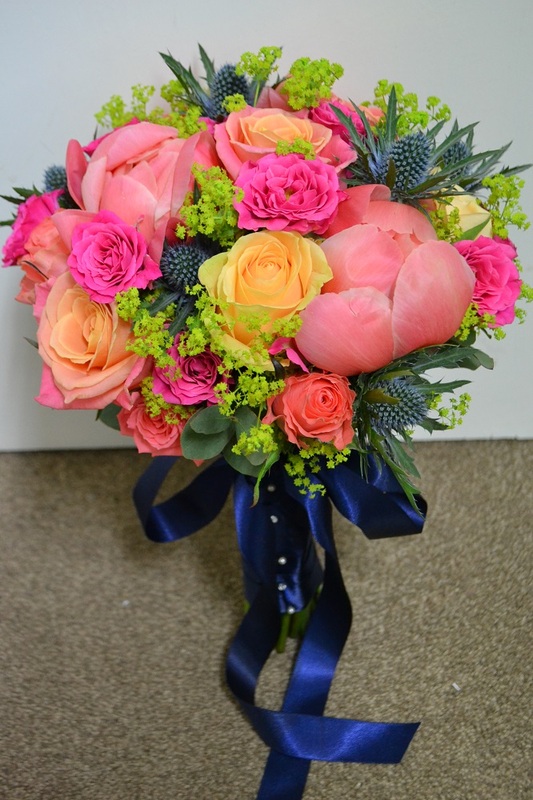 We discussed using coral peonies in the bouquets, along with Miss Piggy roses (which have a pink outer and peachy centre), coral coloured Rosalie rose, peach avalanche rose, hot pink spray roses, blue thistles and lime green alchemilla mollis rather than the more traditional forms of foliage. 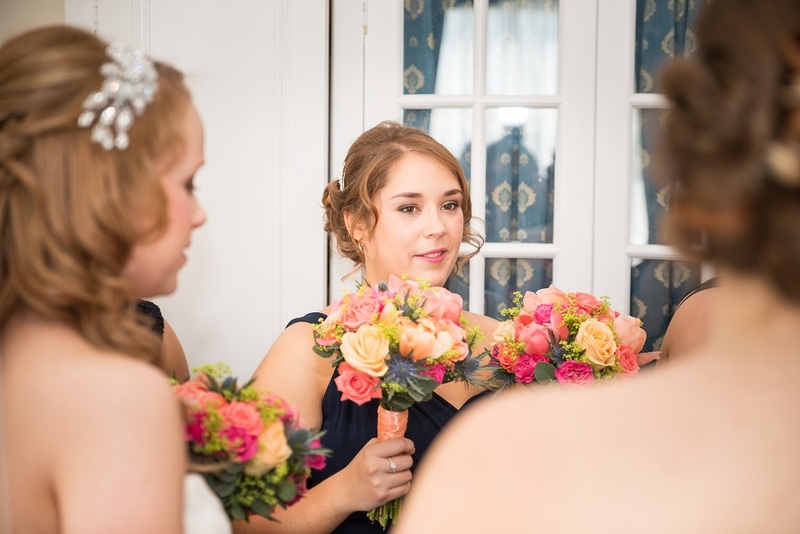 Gemma chose hand tied bouquets for her and her bridesmaids to carry, with her larger bouquet tied with navy blue ribbon and a trailing bow, decorated with diamante and pearl pins. 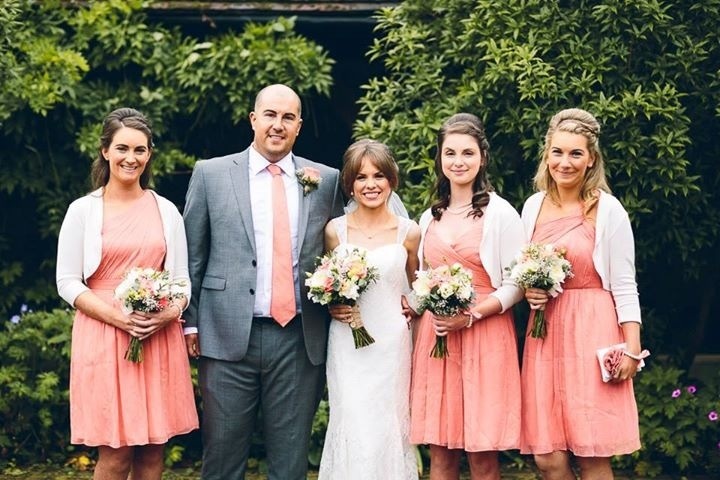 The five bridesmaids’ carried smaller versions and were finished with coral coloured ribbon and diamante and pearl pins. For the reception decoration, the centre pieces included our glass rose bowl vases with a dome of flowers bursting with colour. 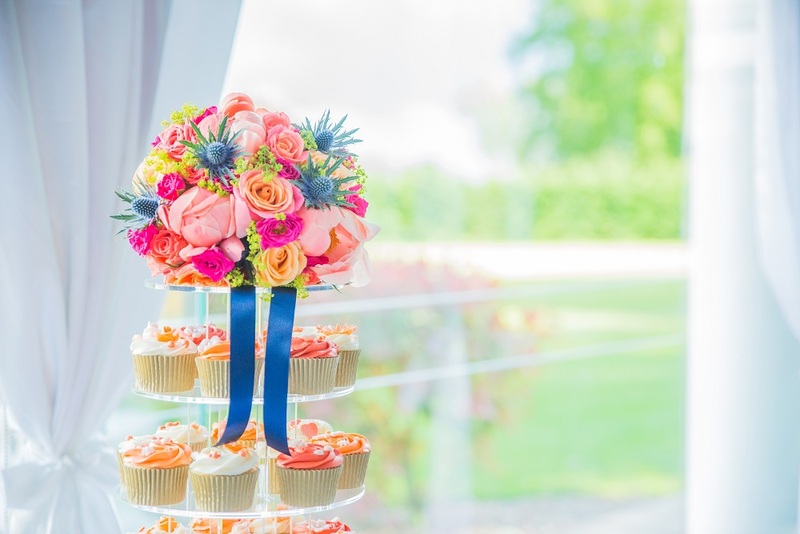 They featured the variety of vibrantly coloured roses in the coral and peach tones from the bouquets, the hot pink spray roses and the blue thistles. They also included the lime kermits and alchemilla mollis for the lime green pop. Surrounding the central displays were clear glass votives with tea lights and clear dew drop scatter beads. 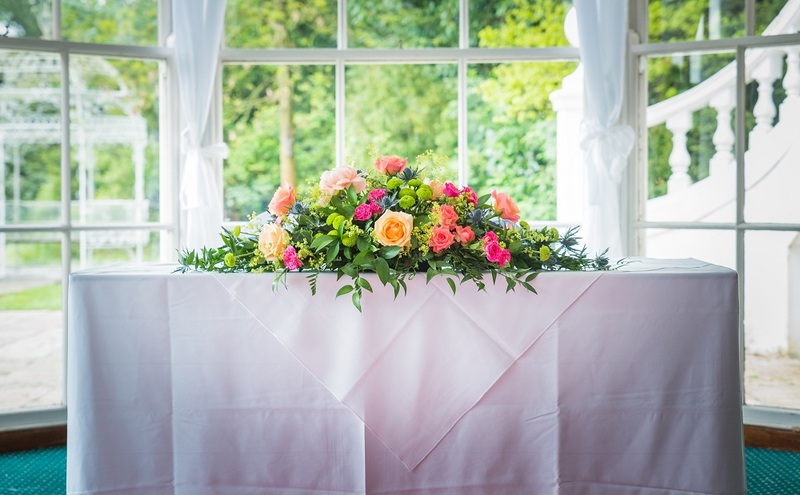 The registrars table was decorated with a traditional long and low display highlighting the bride’s bouquet flowers, peonies and roses, and incorporating the flowers from the table decorations along with plenty of green foliage to highlight the colourful flowers. 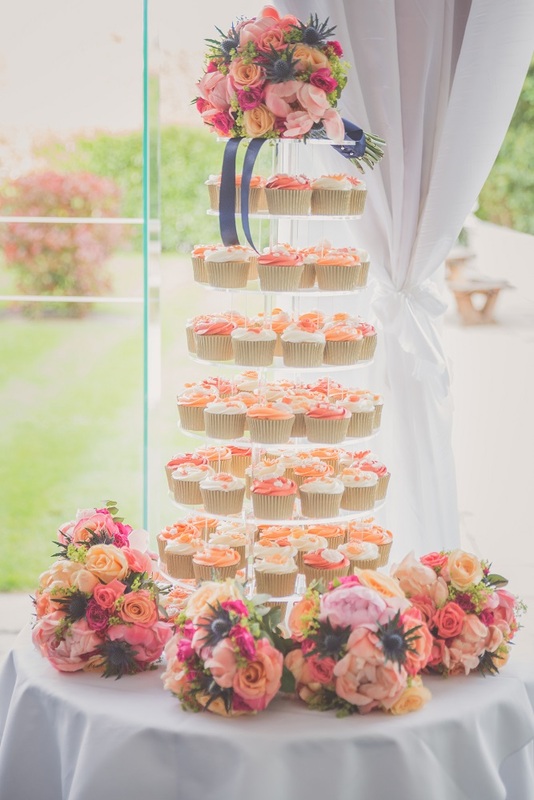 To help keep the cost of the room decoration down, the registrars’ table display was reused on the top table and the bride used her bouquet to top off the cupcake tower wedding cake, to beautiful effect.